Seven people died and 88 were injured in the quake, including 21 seriously. A 6.5-magnitude earthquake rattled southwest China late Tuesday, killing at least seven people, with up to 100 feared dead, according to a government estimate. Seven people died and 88 were injured in the quake, including 21 seriously, the official Xinhua news agency said. It said that at least five of the dead were visitors to the touristic area. The state-run People's Daily newspaper reported that nine people had died, including six tourists, with over 130 injured. But China's National Commission for Disaster Reduction estimated that as many as 100 people may have perished, based on 2010 census data of the mountainous, sparsely populated region. Over 130,000 houses may be damaged, it added in a statement posted on its website, based on a preliminary analysis of the disaster in a remote region of Sichuan province. President Xi Jinping called for "all-out efforts to rapidly organise relief work and rescue the injured people", according to Xinhua. "I was also in Jiuzhaigou in 2008 during the last big quake, so I knew what it was. This felt even stronger," she told AFP by phone. "People didn't dare grab anything like money or clothes -- we just all ran outside right away, " she added. The quake occurred around 9.20 pm (1320 GMT), not far from the site of a massive 8.0-magnitude earthquake that struck in 2008 leaving 87,000 people dead or missing. Its epicentre was 284 kilometres (176 miles) north of the provincial capital Chengdu and struck at a depth of 10 kilometres, the US Geological Survey said. The affected region, Jiuzhaigou county, includes one of the country's most famous national parks, a UNESCO World Heritage Site known for karst formations and lakes. Xinhua said that a landslide at the tourist site left more than 100 visitors trapped, but no deaths or injuries were reported among them. The People's Daily posted video footage on Twitter reportedly showing tourists cut off in the area lighting a camp fire to keep warm at night. It also posted photographs of people sleeping under blankets on streets in the area. More than 38,000 people visited the tourist site on Tuesday, according to the official Xinhua news agency. Some houses at the scenic spot collapsed following the quake and authorities were organising young people to help evacuate residents, a staff worker at the park told Xinhua. Photos from the area posted to social media showed masses of people milling about on streets scattered with light debris, and a taxi dented from being hit by a large boulder. Over 600 fire officers and soldiers have been deployed, the People's Daily newspaper said. The Red Cross Society of China said it was deploying emergency specialists and volunteers to assist affected communities. "The quake hit at night, communications lines and electricity are disrupted and people are no doubt shocked and scared," said Gwendolyn Pang, a spokesperson with the International Federation of Red Cross and Red Crescent Societies in China. "It may take some time to learn the extent of damage and casualties." 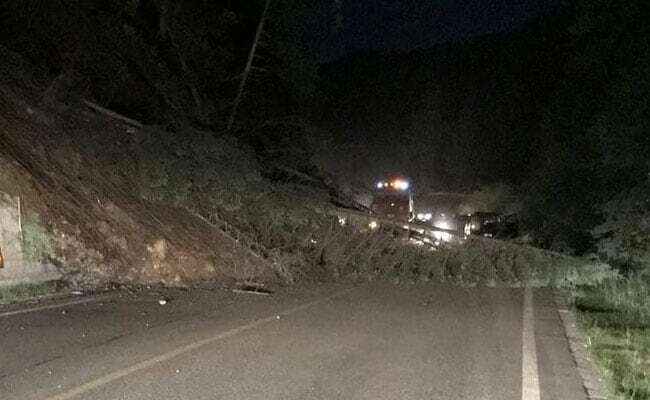 Earlier today, a landslide triggered by heavy rains killed at least 24 people in a different, mountainous region of Sichuan to the south of Chengdu.